The chaurice is flavored with some classic southern ingredients green onions, onions, celery, garlic. There's also some fresh parsley, black, white cayenne pepper, salt, dry thyme, paprika in it which makes for quite some spicy heat. And then there's all natural pork. 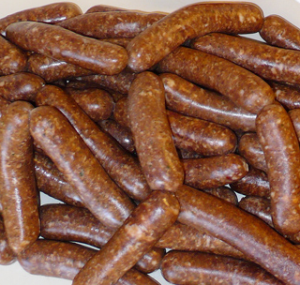 The chaurize is, similar to an andouille, mostly used as seasoning sausage rather that eaten as is, like a brat. It's known to be the traditional Red Beans & Rice sausage: cut it in chunks add it to the beans or pan fry it, before adding it to a hearty root vegetable stew.